How to use Terraform to automatically provision a static website and scalable dynamic (Kotlin) form processor to store made up data in a DynamoDB table? That was the question I tried to answer in a proof-of-concept (PoC). It’s been published open source on GitHub. This post goes into a bit more detail on how the proof-of-concept came into being, why different design decisions were made and how the code works. Software Engineering courses in the mid-90s taught the mechanics of building good projects. In the main, they sought to introduce the software development lifecycle (SDLC) and familiarise students with it. Work out what you’re building, design it, build it, test it, ship. There are problems with this sort of waterfall SDLC, not least of all the bugs and limitations introduced by coding and supporting it all in-house. Perhaps design, build, test, delay, debug, delay, ship, patch? By the middle of the following decade, the model had turned on its head. Engineers had become curators of code, sharing, selecting and refining an internet full of examples, frameworks, open source libraries, gists and StackOverflow answers to compose a solution. “Not invented here” became a badge of honour, instead of a digital prejudice that slowed innovation. The nature and timing of major sporting events means that many customers place bets at the same time. During those peaks, Sky Betting and Gaming’s servers receive many hundreds of requests per second, 445/s during the run up to this year’s Grand National at Aintree. Like almost any large web service, Sky Betting and Gaming need an adaptive and reactive infrastructure that can cope with the spikes, but scale back during the quite times. Bets are complex to strike, so for this PoC I’ve simplified the model. 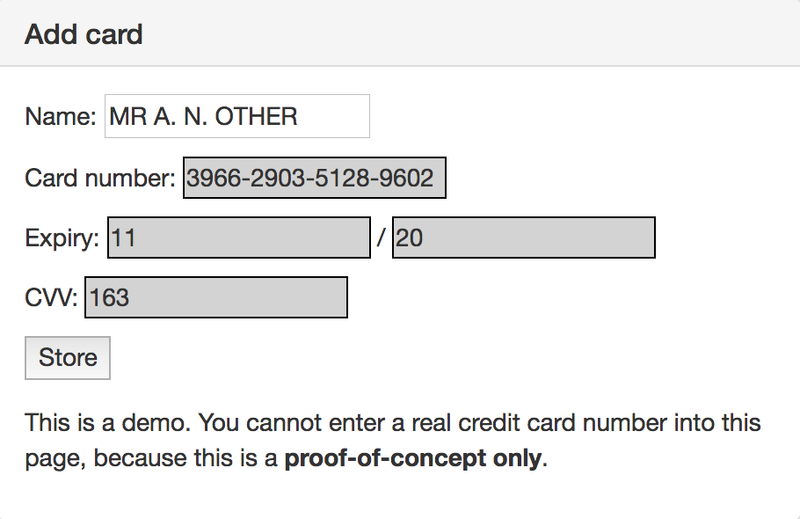 Here’s a static HTML form that purports to gather credit card information. Because it’s a PoC, it actually doesn’t gather any sensitive data. Instead it generates random data and pushes it to the form processor for storing in a database, though the form target isn’t set until we create the form processor using Terraform. Several forces have shaped the demand for and form of this PoC. As the pace of technology development has been accelerated, by more people doing it and more of them sharing it openly, great solutions to many of the problems landing on my desk were just ‘out there’. To solve problem D, it was no longer necessary to solve problems A, B, and C - the generic (boring) precursors - to get to the good stuff. Coders got to concentrate on the top of the pyramid, the bit that was specific to the core business. I saw Arun Gupta give a talk at Devoxx UK 2017. This table comes from his well-worth-watching talk entitled Deploy microservice using Amazon Web Services S3, API Gateway, Lambda and Couchbase. Arun highlights the change that I’m talking about. Where before we had to solve the hardware problem, in that we had to build and operate hardware to run the apps, there was now a service whose total cost of ownership (TCO) was substantially lower. The same applies to the management of virtualisation layer, operating system, container, run-time environment (JRE). To say it’s ‘solved’ is a bit of an over-simplification, but the point is that there are managed services in each of these domains that reduce the amount of management we have to do of them. Serverless computing is another example of a shift that allows us to focus on the top of the stack. Thinking back to those Software Engineering courses from twenty years ago, many taught C, Java and sometimes Haskell. That language selection was pretty cutting edge at it’s time. C for memory management, Java for OO design and Haskell for a functional future that we didn’t quite understand yet. Sky Betting and Gaming has always been progressive in its attitude towards language selection, so anything that lets the engineering teams cut better code - cleaner, clearer, more reliable, more scalable - is welcomed into the supported tech stable. Kotlin is a fantastic divergence from Java so let’s use that for the PoC. It’s not one of the AWS Lambda natively supported languages, but as it’s JVM-based we can compile a fat JAR and run in the same way as Java. On the infrastructure-as-code (IAC) side, multi-cloud languages like Terraform are making it easier to spin up and glue all the pieces together; and there are a whole lot of pieces. It also means the whole shooting match can be instantiated with a single terraform apply, rather than an elaborate “open this console window and tick this option” tutorial. Gone are the days where you can stick a form handler in a single PHP script and fire requests at it. 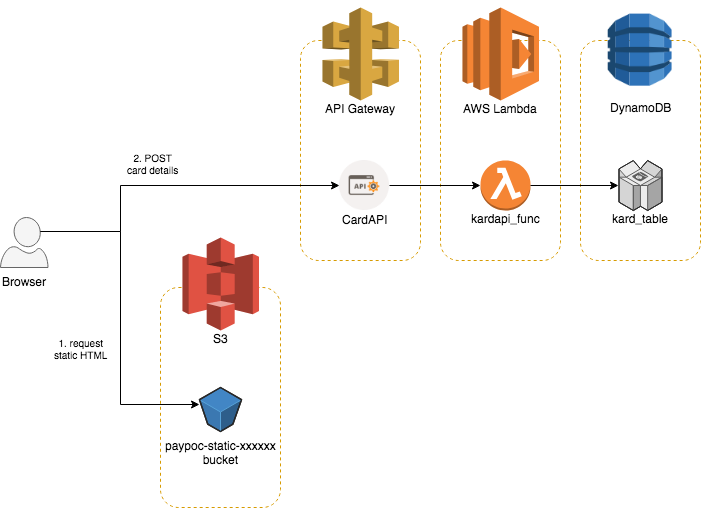 That AWS Lambda function needs some infrastructure wrapped around it to handle the NFRs. All of these factors compound to create the unknowns that this proof-of-concept seeks to better understand. Broadly, what are the performance characteristics associated with using Kotlin-based Lambda functions to dynamically scale to meet demand? if (name == null) name = "MRS A. N. OTHER"
^ This also creates random defaults if for any reason the form fields aren’t set. This will be useful later when we come to load test it. description = "Kotlin CardAPI HTTP request handler"
name        = "Card API in Kotlin"
description = "Terraform with AWS Lambda"
# within the API Gateway "REST API". message: "Kotlin function executed successfully. log_group = /aws/lambda/kardapi, log_stream = 2018/05/10/[$LATEST]5f7356899dcd4997bd45a0bee9c08e78"
It’s important to mention that I’ve done zero optimisation on this, so it’s a crude illustration of the Lambda starting point, not it’s ultimate performance. I started on a Lambda-based (Node.js) load testing function, based on Amazon’s reference example. There exists a DynamoDB “click-to-encrypt” type option, but at the time of writing it’s not in Terraform yet. I’m confident it will be shortly, so I’d like to turn that on to more closely mimic a live environment. Alternatively, I’d like to create a KMS key pair and use it to do in-app encryption of the data, but that’d be more expensive because you pay for Lambda execution time. I’m in the habit of writing AWSpec tests for provisioned infrastructure, but haven’t worked out the best way to do that for Lambda functions yet. In fact Lambda test-driven development (TDD) is a whole area I’d like to investigate further. All the code in this post is available in the GitHub repo. There’s also a getting started guide to help you set up your AWS Environment and local/remote provisioning machine to bulid the PoC using terraform. Enjoy!